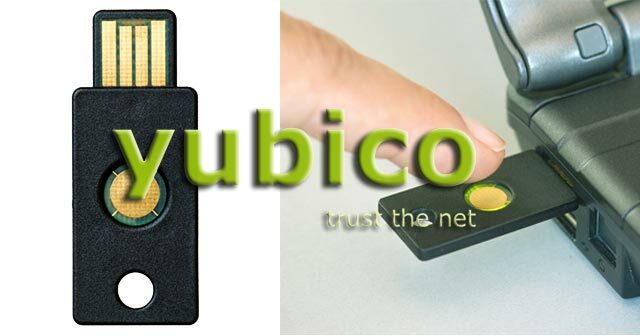 Yubico Yubikey: Solution for Flash Drive Encryption? It’s a small high tech device that exceeds the functions of tokens and smartcards while utilizing the power of USB encryption. If you’re not yet part of the more than 10,000 YubiKey users around the world, the product’s innovative approach to flash drive technology may give you enough reasons to get your hands on one. First seen in the market in 2008, the Yubico YubiKey is a USB key that is smaller than the typical USB storage flash drive and has an integrated touch-button which makes it capable of generating One-Time Passwords (OTPs). The YubiKey connects to any computer through the USB port and functions without the need to download any software. Place your YubiKey on a key ring, as this minute device, which has a stylish rugged design that offers no lifetime limitation, is as small as the typical house key! But rest-assured, YubiKeys are ultra-thin, battery-free, crush safe and waterproof. YubiKey has been designed for applications where a username or password is no longer that secure. It avoids common ID theft issues such as phishing, key loggers and other means of eavesdropping. One of the greatest things about YubiKey is that it enables users to combine a PIN or password for authentication that works two-fold. Two-factor authentication combines ‘something you know’ (username and password) and ‘something you have’ (card, mobile number, etc.) to screen a user before use. YubiKeys are manufactured by using unique technology from Yubico’s plant in Sweden, where one solid piece of plastic allows the fully-automated manufacturing of multiple devices. The Yubico YubiKey tooling is made of a single piece of steel where five YubiKeys are made per machine cycle, with a cycle time of just 40 seconds. During this very short period of time, all the Yubikeys have been finished, tested and packed in trays. At this rate, a whopping 450 YubiKeys are rendered in an hour; that equals the production of 10,000 USB keys a day! An industrial robot handles the electronics and finished parts, takes the “brain” (in the form of a circuit board) of the YubiKey from a tray using suction, inserts the circuit boards in the 50-ton injecting molding machine and places the finished products to the trays. This type of automated mass manufacturing has made YubiKeys the most cost-efficient device of its kind. No wonder, YubiKey has made its name all around the world – the latest is its deployment in the country of Turkey. The Turkey Customs and Social Agency, which has over 10,000 staff members, are now utilizing Nordic Edge One Time Password Server, which has integrated YubiKey’s authentication tokens. Yubico has also recently integrated with providers of identity and access management solutions (such as verifying PayPal accounts) with DS3 and Verisign. How would you take advantage of the sweet features of a Yubikey? Don’t forget to share your thoughts! This entry was posted in Articles, USB encryption, USB Flash Drives, USB Technology, Yubico, Yubico Yubikey, Yubikey USB Key and tagged Flash Drive Encryption, USB Encryption, USB Flash Drive Encryption, USB Key, Yubico, Yubico Yubikey USB Key, Yubicos Yubikey, YubiKey, YubiKeys. Bookmark the permalink. One Response to Yubico Yubikey: Solution for Flash Drive Encryption? we are implementing nordic with yubikeys, to both our internal staff as our customers. this is truly a great option pricewise. I personally have been using it with lastpass for a couple of months, with great results.